In a business world of nonstop change, there's only one way to win the game: Transform it entirely. This requires a revolution in thinking--a steady stream of disruptive strategies and unexpected solutions. In Disrupt, Luke Williams shows exactly how to generate those strategies and deliver those solutions. This book reflects Williams' immense experience creating breakthrough solutions at frog design, one of the world's leading innovation firms. Williams shows how to combine fluid creativity with analytical rigor in a simple, complete, five-stage process for successfully disrupting any market. You'll learn why the most unexpected ideas draw the least competitors--and offer the greatest potential. Then, using many examples and a case study, you'll walk through every step of transforming disruptive ideas from conception to breakthrough business strategy. Avoid the resource-killer that is "novelty for novelty's sake"
"Remember the old Apple tagline, urging us all to 'Think Different?' In this book, Luke Williams shows us how to do precisely that. Disrupt helps you look at business--and the world around you--through a fresh lens, one that turns assumptions and convention upside down. Best of all, this is a practical book for the real world--Williams reveals not just how to come up with disruptive ideas, but how to nurture them, test them, pitch them, and ultimately make them real and profitable." 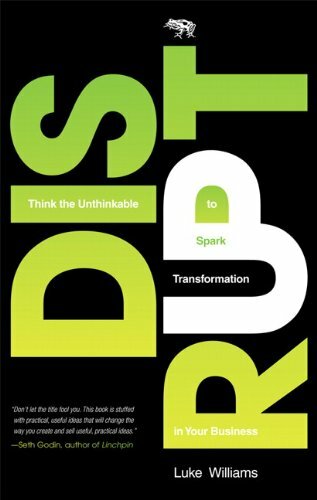 "By artfully smashing ideas together--from Schumpeter to Tarantino, business to design--Luke Williams upends the ordinary, providing the reader with a motivational and pragmatic blueprint for innovative thinking." "At some time, someone somewhere is going to disrupt your entire industry. Shouldn't it be you? In this easy-to-follow step-by-step guide, Luke Williams reveals a way of thinking that has the power to transform your business. Read this book before your competitors do." "For those companies second guessing their future paths, ponder no longer. Disrupt provides that path, and it may be your real only strategy in today's climate." "I've observed Luke's process of disruptive thinking generate remarkably innovative solutions. I hope that many more companies will disrupt their existing innovation processes to benefit as well. They'll be glad they did!" "Luke Williams is the master at unleashing big thoughts. His book, Disrupt, shows us how to do what sometimes seems impossible--conceiving and executing bold ideas with massive potential. At the Nike Foundation, we've put Luke's principles to work and had tremendous results."